One of the best jobs I ever held was as a tour guide at the Marin County Civic Center back in the mid-1960’s. The iconic building was the last of Frank Lloyd Wright’s masterpieces. In fact, when I worked there only the Administration building was completed but we were awed by the scale model of what was to come – a judicial wing, an arts building and a heliport (which was never built). Still, as I led tour after tour on the weekends my appreciation for his architecture grew. 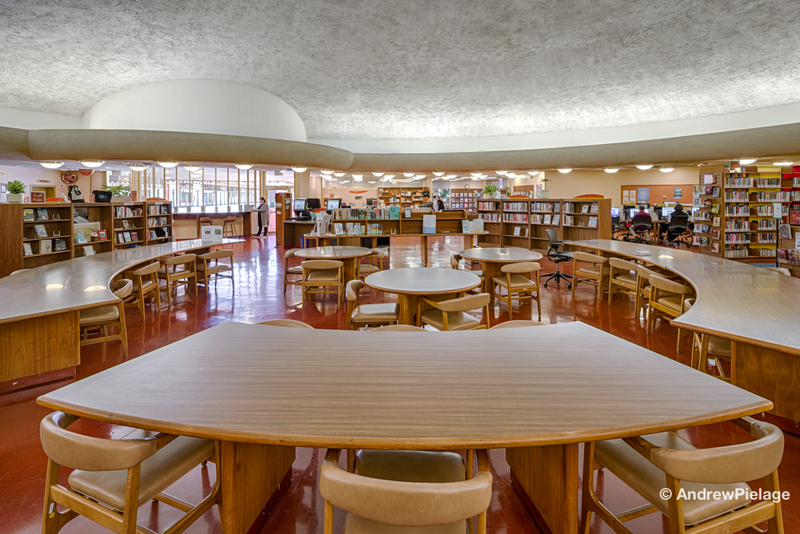 In my opinion, no part of the building was more stunning than the library, with its rounded ceiling and open spaces. I was fortunate enough to develop a love of books from a grammar school teacher who spent a whole year teaching us how to read a book. She introduced me to Nancy Drew, Tom Sawyer and Louisa May Alcott. So, oftentimes on the weekend when my fellow tour guide and I didn’t feel like leading a tour, we’d put a sign on the desk saying we were out touring and would return in 30 minutes. And then we would sneak off to the library. Over the years, whether I was in a studio apartment or a larger home, I always maintained a library. To this day I have some of my college textbooks, which come in handy when I want to learn something about ancient history! In my current house we converted what the architect considered a necessity, a fourth bathroom, into something I considered an absolute must – a library. I even organized it by subject matter and author. I know, I’m a geek. 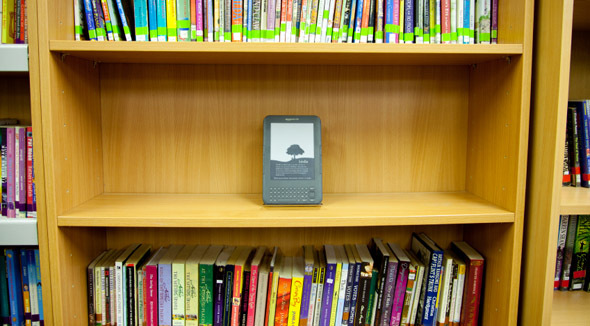 So, when the eBook revolution came about I was one of those who swore I would never convert. I scoffed at those who jumped on the bandwagon, even as I lugged my huge canvas bag of books on every vacation. I think it was on one of those trips when my husband commented about the “rock collection” I’d brought along, that I began considering an eReader. In 2010 I relented and bought my first Kindle. I’m now on my fourth. I love that I can store hundreds of books, that I can read at night with the light off so as not to bother my husband or Dash the Wonder Dog, and it has kept me amused as I’ve waited at doctor’s offices, airports and the DMV. So it was with some interest that I read an article in Inc. Magazine recently noting that according to The Wall Street Journal, sales of traditional print books rose by 5 percent in the US last year, while sales of eBooks plunged by 17 percent. No one knows exactly why that happened or if it’s a lasting trend. They do cite two very good reasons for the switch. First, real books can be shared. Remember the days when we paid $20 for a book and then passed it around to 10 friends? Now everyone has to pay around $13 for their own download. The second reason they cited is that real books make more meaningful gifts. I couldn’t agree more. I still remember who gave me books as gifts and the sentiment behind the purchase. I also love a hardcover when I’m reading one of my historical biographies with a complicated family tree illustration just so I can easily flip to the chart when I can’t remember who’s married to whom. Those are indeed good reasons to buy a real book, but last night I discovered perhaps the best reason. A week ago my daily email from Kindle advertised a novel about women in WWII. Always a sucker for a good war book, I decided to download it. Amazon informed that I already owned it. So I went to my archives and, indeed, I bought it in 2013. I downloaded it to my current device and began reading. It wasn’t until last night, one third through the book, that I realized I’ve read it before. Hey, I’m not beating myself up. I can’t remember what I had for dinner last night, much less a book I read six years ago. But thinking about this post today I realized that perhaps the best reason for a real book is that after you’ve read it there are creases in the spine or perhaps a dog-eared page or two, alerting you that you’ve been down that path before. On the upside, re-reading a good book is kind of like meeting an old friend. I guess there are benefits to losing your memory!